Individual performance is affected by thinking and behaviour. The Life Styles Inventory can help people to understand which behaviours are supporting and which are detracting from effective performance. Fortunately, people can change their thinking and behaviours, but first they need to know what to change. The LSI Inventory helps individuals to strengthen the behaviours which increase personal effectiveness and moderate those which prevent them from realising their potential. The LSI can be used for both self-assessment and 360º assessment. The Life Styles Inventory is based on the Circumplex and can be applied at all levels of an organisation using tools such as the OCI and GSI. Click on the Circumplex for a larger image. 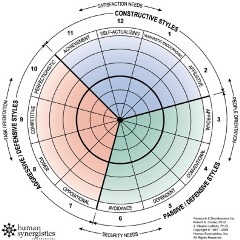 The LSI provides individuals with tremendous insights into their personal thinking styles and maps these using the Circumplex model. An outcome of the LSI is normally a personal development plan which identifies practical strategies for improved personal effectiveness. The LSI can also be used to obtain 360° feedback, providing invaluable information to guide and track self-development activities.